Two weeks ago my most precious 90 year old Granma (also known as Gee Gee to the boys) suffered a stroke which was severe enough to put her in ICU and after suffering a number of heart attacks while in hospital, after a few days the hospital made the decision that palliative care (end of life care) was the only remaining option available. Mum, Dad and I made the trip down the same day as the stroke to see her briefly in hospital, and then again on the Friday when she'd returned back to her rest home for palliative care where she was still responsive but didn't open her eyes during that time - the most animated she got was when we mentioned the Hurricanes were playing in the final - she always did love her sport. On the following Monday Mark and Dad went back down to see her (as Mark hadn't had a chance to at that stage), and then on Wednesday Mum and I went back down again - it was a very special four hours we spent with her and we didn't know that when we left at 3pm for the journey back to the Waikato that she would be leaving us for Heaven by the end of that day. It was almost as if she waited to see us one more time. It was hard seeing her on the Wednesday as she was very clearly near to the end but I'm still glad we made the effort to go. It was a special time spent just Mum and I too travelling down and back - it's not often we get six hours alone in a car together to chat about life. We then had to scramble to get ourselves organised to attend the funeral on Saturday, trying to pull together a number of different schedules - we had Nic and Maia to get over quickly from Melbourne (Kim was away in Canada for work), we had to get Sam back on an aeroplane to Auckland on Saturday night for a business trip to Canberra on Sunday, and Dad was due for a shoulder operation on Monday (today) so if the funeral had been any later he wouldn't have been able to make it either. In the end all the logistics came together for us all to be together. We booked a few rooms in a motel in New Plymouth and had some special times just catching up as a family amongst the sadness of the reason for being together this weekend. 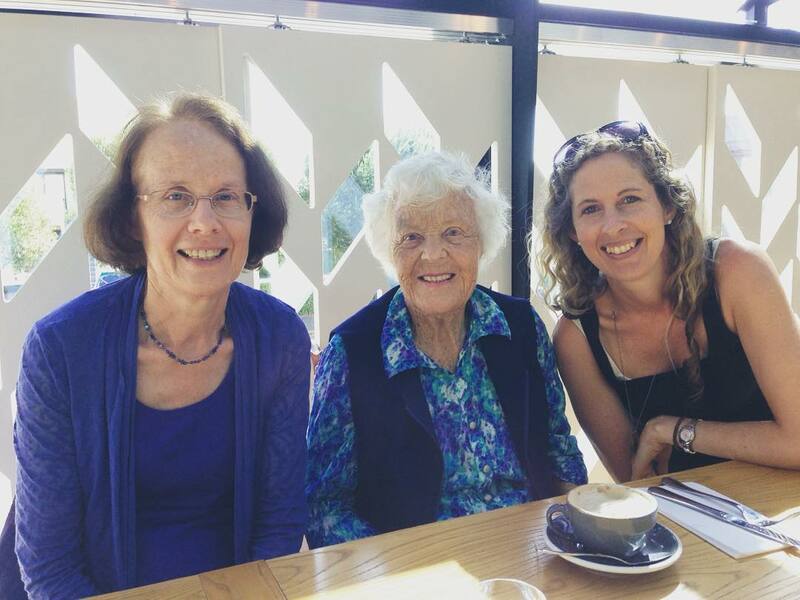 Mark and I took the boys out to a cafe after we saw Gee Gee lying in rest at the funeral home and we went to Chaos Cafe - where we'd last had coffee with her back in May - such lovely memories - going out for coffee and a muffin was one of her very favourite things to do. I'd been asked if I would put together a photo slideshow of Granma's life which was a great honour but was also a lot of work over a very short time as I had to scan in so many old shots from old black and white hard copy prints. I also had to try and ensure I got a good cross section of extended family in the slideshow with the photos I had available to me and in only two days - it would have been easy to fill the slideshow of just my own photos with her but I also had to try keep a lot of other people happy. Growing up, I looked forward to every school holiday which would see us making the road trip from Auckland to the Naki. Even though it was sitting in the back of an 800cc Suzuki van squished in with my 2 younger brothers. And even though invariably one or other of us would get so sick on the fumes and windy roads that we'd have to have a vomit stop - usually somewhere around Te Kuiti. That was until they invented sea-legs tablets and Mum would serve these up to us for breakfast before we headed out. After that, not feeling sick and trying to hold in those nauseous feelings almost took some of the fun out of the journey in a strange way. I even remember a few night trips leaving Auckland after Dad finished work and us falling asleep in the car on the way there. With the portacot set up in the back of the van for my littlest brother to sleep, no safety belt or anything - those were the days! In the early days our holidays were at the Surrey Road farm - that big sprawling farmhouse and gardens were so awesome for us as kids to enjoy games of hide and seek or trips over the farm to the cowshed and beyond. For us city kids it was like an amazing haven to retreat to and allowed us a glimpse of what real NZ country living was all about. When I was about 10, Granma and Grandad retired to New Plymouth to the house at Lismore Street which had its own lovely appeal with its bush setting and lovely views of the sea. Games of cricket in the garden, many hours spent pedalling out classical tunes on Granma’s antique pianola piano, taking over their dining room with games of snooker on their portable table, annual pilgrimages to the Festival of Lights at Pukekura Park and even a cricket game between Central Districts and Canterbury there where my crush on several cricket players who went onto become NZ heroes began with photos and autographs with the players. The best holiday for us was always the Christmas holiday where we would stay for at least a week, and then sometimes one of us kids would take a turn to stay on an extra week by ourselves with Granma & Grandad. Oh happy days. A week of being spoilt rotten, treated to special one-on-one time which usually included a trip to the toy shop, a fast food outlet, plenty of card games with Granddad, piano playing, staying up late watching TV and all the other wonderful treats that a grandparent's perogative allows! I was able to reciprocate a tiny bit when I looked after my grandma for a few days after one of her hip replacements when I’d just finished up university and was heading to Wellington to live. 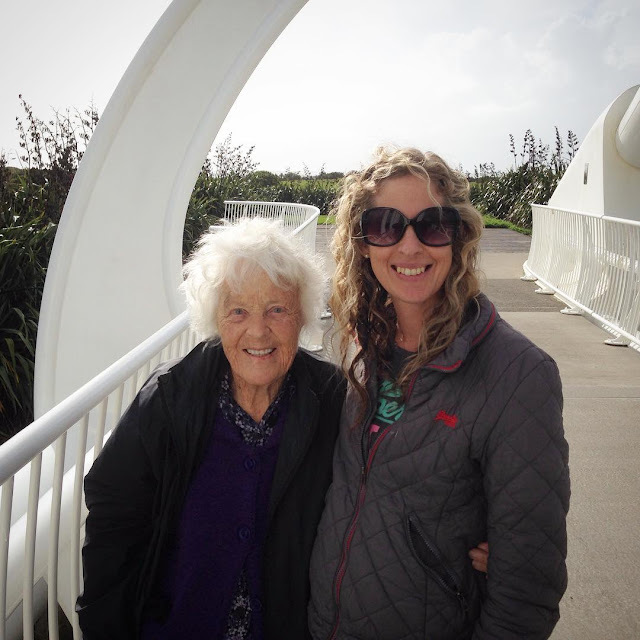 And when Mum & Granma went on their amazing adventure to England together in 2002 Mark and I took several weekend trips up to Taranaki to make sure Grandad was behaving himself too. It was also very special for me to have both my grandmothers at our wedding in 2004. In 2006, Granma became Gee Gee when Noah (her first great-grandchild) was born. I had forgotten until events of recent weeks reminded me that she was the first to meet Noah of our extended family beating even my Mum and Dad to it. She’d just happened to be on a train trip to Wellington (something she’d always wanted to do!) and arrived in late one Saturday night just 3 days after Noah was born - he was a week early. Mark picked her up at the train station and brought her to our home for an hour to meet our little guy - what a special moment that was. Fast forward three years down the track and a trip down to Wellington to see us coincided with my 20 week scan where she sat right beside me in wonder as we learned that Noah would be getting a little brother. 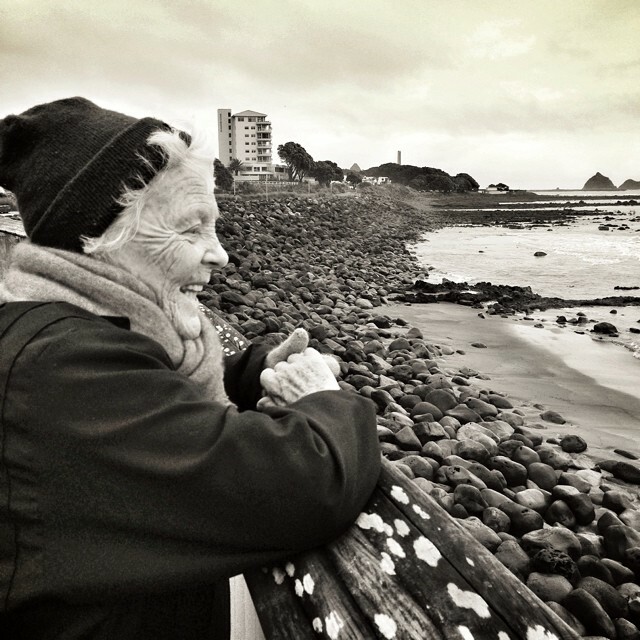 Most years we would make the trip up to Taranaki from Wellington 3-4 times a year to stay with Gee and even up to five years ago at age 85 she was still taking flights to Wellington to see us when I found her cheap Grabaseat flights to come and stay. I’ve lost count of how many Easter egg hunts we had with the boys in the garden at Truby King Street, visits down to the back fence to look for the horse that lived down in the valley, cuddles with her cat Panda and trips down to the coastal walkway where we enjoyed strolling along at her gradually slowing pace. The thing about Gee Gee was her never ending capacity to love, and be generous. You always knew you’d leave her house full as a goose having been plied with baking morning noon and night. She was without doubt the most generous person I met - you never could outdo her with paying for things even if you wanted to - she’d always find a way to get one back in the end. And her love and pride in her family was never in doubt. Every time we went to visit we would hear all about what each family member was up to - from the oldest to the youngest - her pride in what her kids and grandkids were doing was the highlight of our many conversations. And if we weren’t talking about what the family were up to she would wax lyrical for hours on sport - which was her very favourite thing to watch - from netball to tennis, cricket and rugby - it was all fair game for a long and lengthy discussion - something I know all the males in the family loved about her including my hubby Mark who adopted Granma as his own grandmother the minute he arrived in NZ. There is always the possibility of a very special bond developing between a grandchild and their grandparent. I say possibility, because like all relationships it has to be tended, cultivated, and given the right combination of love and time to grow into a one-of-a-kind, magical connection. It’s what I had with Granma, and what my children also had with their Gee Gee. I am forever grateful that God allowed us to have so much time with her. Rest easy now Granma knowing you leave behind a legacy of love that will not be forgotten. We gave her a wonderful send-off but I admit I already miss her so much. She's been as close as a parent to me and as close as a grandparent to my boys. She was so full of life her whole life - everyone who met her always said how warm and friendly and welcoming she was. I still can't quite believe I won't see her again this side of Heaven. But I know how much pain she'd been in as well and I'm so glad she's free of that now - in her new Heavenly body, dancing with the angels, free at last. I can still remember the day as if it was yesterday. The day I became a mama. A cold winter's day in Wellington. A mid-morning dash to the hospital and a serene water birth within an hour of arriving at the hospital. And yet suddenly just like that my eldest is 10 - and I'm left speechless... how quickly these years do go by... and it's true what they say... to cherish the moments when your children are small because suddenly they're not that small any more. And now we're staring down the barrel of the tween and teen years and when I think that Noah has probably already lived half the time he'll live here at home with us I just want to cry. It's been an emotional roller coaster of a week with our dear Gee Gee in hospital after suffering a stroke on the weekend and I feel much more weepy than normal - right now all I want to do is hold my boys close and love on them something silly. Family is just so so precious. This year we had a quiet family celebration on Noah's actual birthday day and we now await a crazy zorb football party this Sunday with 10 friends. All kinds of chaos.... but he can't wait! This is your life Noah age 9-10 from mnms on Vimeo. And now we can't wait to see what the next 10 years brings for you - although little by little...not all at once please! And we continue to pray God's blessings over you in all you do as you grow and your world expands!